Columbia University biologists have revealed a mechanism by which bacterial cells in crowded, oxygen-deprived environments access oxygen for energy production, ensuring survival of the cell. The finding could explain how some bacteria, such as Pseudomonas aeruginosa (P. aeruginosa), are able to thrive in oxygen-poor environments like biofilms and resist antibiotics. "P. aeruginosa biofilm infections are a leading cause of death for people suffering from cystic fibrosis, a genetic condition that affects the lungs and the digestive system," said Principal Investigator Lars Dietrich, an associate professor of biological sciences. "An understanding of the pathways that contribute to the survival and virulence of P. aeruginosa and other bacteria able to exist in oxygen-starved environments could inform treatment approaches for many of these and other immunocompromised patients." The study appears this week in the journal eLife. Bacteria rarely live by themselves as single-celled organisms. Most instead grow in communities, leveraging the strength of numbers to form a biofilm with tissue-like properties similar to a scaffold that serves to fortify the community, making it up to 1,000 times more resistant to most antibiotics. Each individual cell must on its own extract electrons from food that are then transported along the cell's membrane until they reach an oxygen molecule. The energy released during this metabolic process is used to sustain life. As communities of bacteria continue to grow and form into a biofilm, however, they can become overcrowded, creating an environment where each cell has to compete for limited nutrients and oxygen to survive. Research has shown that some bacteria, including P. aeruginosa, have evolved different strategies to respond to and cope with the low-oxygen conditions in biofilms. Communities of bacteria can, for example, change the overall structure of the biofilm so that its surface area-to-volume ratio is higher and a larger proportion of the cells inside are able to access the oxygen on the outside. P. aeruginosa can also make molecules called phenazines, which help to shuttle electrons from the inside to the outside of the cell and ultimately to oxygen available at a distance. Another strategy is to make alternative versions of terminal oxidases, enzymes in the membrane that transfer electrons to oxygen, which use oxygen more efficiently or are better at scavenging oxygen when its concentration is low. While there have been numerous studies done to examine the importance of these enzymes and strategies for P. aeruginosa growth, they've largely been conducted in well-oxygenated liquid cultures in the lab. When P. aeruginosa infects an actual host, such as a human, it often grows as a biofilm and encounters vastly different conditions. 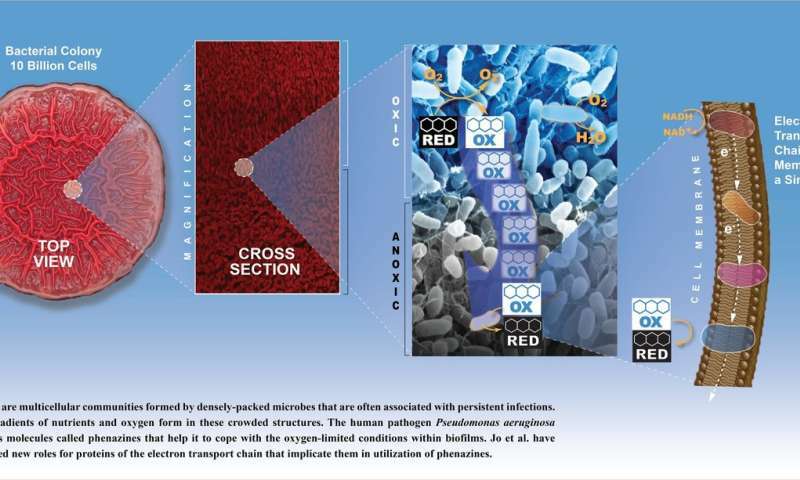 With federal funding from the National Institutes of Health and the National Science Foundation, Dietrich, first author Jeanyoung Jo, and their colleagues set out to better understand whether specific terminal oxidases are important for P. aeruginosa metabolism in biofilm communities, how phenazines can compensate for low oxygen levels, and how these adapted strategies may contribute to P. aeruginosa's ability to cause infections. They found that the electron transport chain so critical to the conversion of electrons to energy can and is operating deep down in the oxygen-deprived biofilm and that in these environments, the bacterium depends on a specific part of the chain's terminal oxidase - a protein called CcoN4 - to access oxygen and grow normally. Cells lacking this protein do not survive as well as cells with it and the researchers believe therefore that CcoN4 contributes to the bacterium's virulence. They also found that CcoN4 plays a role in using phenazines optimally within biofilms. Though these phenazines have previously been shown to metabolically compensate for the low-oxygen conditions in P. aeruginosa biofilms, the mechanism allowing for this had remained a scientific mystery. "This bacterium is a master at finding different strategies to access oxygen," Dietrich said. "We knew that phenazines were involved and that they were somehow helping the cell get oxygen, but we didn't know how. It appears they are coming from the electron transport chain. That's an important revelation. We know that bacterial cells have different ways of metabolizing energy in oxygen-rich environments, but for the longest time we couldn't figure out how they were doing it when oxygen is difficult to access." The findings could have big implications for the treatment of P. aeruginosa biofilm infections, as an understanding of the pathways that contribute to P. aeruginosa survival and virulence could inform treatment approaches for patients. Developing therapies that block CcoN4-containing terminal oxidases, for example, would weaken the bacterium and its ability to cause infection. "We're starting to understand more and more how cells are able to survive in pretty horrible circumstances," Dietrich said. "We're understanding the mechanism. Now we can begin to look for ways to shut down that process."